Two recent charts say it all. The first shows the average growth in tuition versus income over the past 35 years. As you can see our growth in income (United States only) through 1986 kept pace with the growth in average tuition (plus fees, room and board). 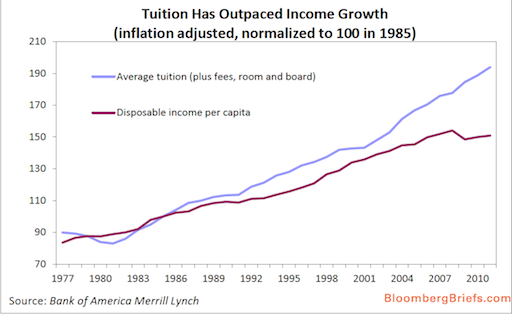 Since 1986 our growth in income has not been able to keep pace with the growth in average tuition. This means that, at least here in the U.S., our ability to meet the growth in average tuition will have to come from our savings, borrowing, or by shrinking our standard of living (i.e. decreasing our spending to offset our lack of increasing income and using that savings to pay college tuition). Another possible outcome is to shrink our post high school educational expectations by: 1. Attending two year colleges or trade schools, instead of four year colleges. 2. Attending those four year colleges, where college tuition is rising less then the average 3. Not attending college at all, and begin looking for work immediately after high school at a lower wage, and thus possibly opportunities for a higher standard of living than our parents. Another solution would be for colleges could seek alternate funding sources, besides annual tuition increases that year in and year out rise higher than inflation for other goods and services. Of course, with colleges already finding it more and more difficult to receive funding from states to pay for their operating budget and so far being unwilling to cut significantly their costs, the only alternative has been to keep charging higher and higher tuition, again, as the chart above clearly shows. As you can see with the next chart, borrowing from tomorrow’s not yet earned income (otherwise known as debt) to pay for college, seems to be the choice that students and their families are making in ever increasing numbers. Students are borrowing less to pay for cars and buy the latest fashions, and since 2010, are instead borrowing to pay for college. 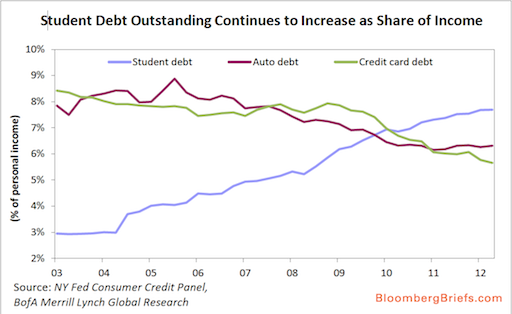 Student debt in the United States now surpasses, as you can see, total credit card debt. Students in the U.S. are increasingly becoming buried under their student loans, loans that cannot be easily discharged under current bankruptcy laws. If interest rates were to rise, (and they can’t stay rock bottom forever) then the amount of a student’s income that would be use to pay their monthly student loans will skyrocket–all but making an entire generation insolvent, before many have begun to enjoy the fruits of their hard-earned college degree. This increasing student debt burden falls on top of an already difficult time in getting a job which many college graduates face today. So, as you can see, something has to give. States cannot continue to cut funding to colleges–which means raising taxes or cutting from somewhere else in the budget. Colleges will have to cut costs, students and families will have to cut back on educational spending, because they can’t borrow forever, and the Federal government–with its own $15 trillion plus debt problem–cannot subsidize student loans and grants forever. The moral of the story is to plan ahead by saving today for that sure to be rainy day tomorrow, or for students to plan on living at home much longer than you or your parents expected. Art Baird, a former high school teacher-whose academic work is in business and economics-continues to study economic and financial theory, as well as micro and macro economic/finance issues of the day, when not playing his role as one founding partner in Creative Marbles Consultancy. You can contact Art at art@creativemarbles.com or, read his short biography. “No Student Loans”: Is that possible?